Cherish your life ， stay away from （physical act of doing）drugs. Oddly enough the xi character is traditional Chinese and I can’t locate the character on my computer. The rest of the characters are the standard simplified Chinese used on mainland China. 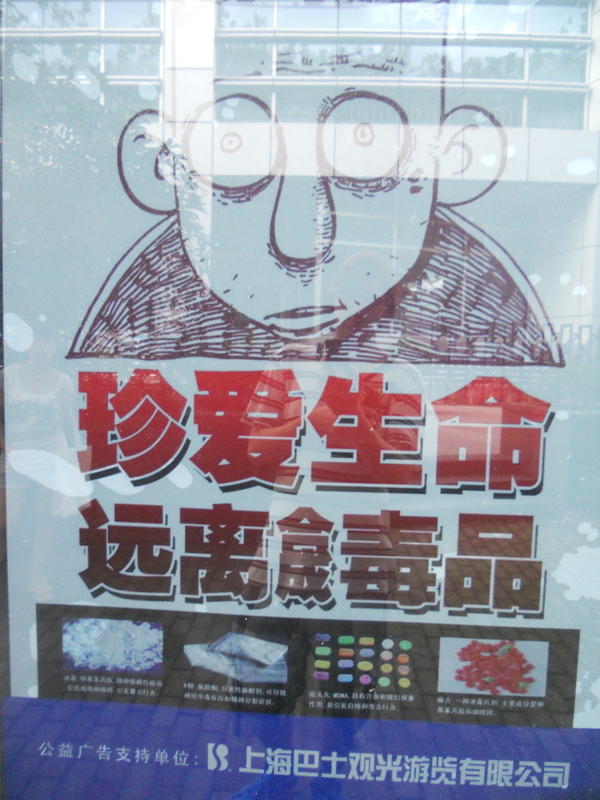 An interesting PSA slapped on the back of a bus stop on Jian Guo Xi Rd. Yaba (A southeastern amphetamine pill) in Thai literally Crazy Drug but Chinese doesn’t use the literal translation, they adopt the sound. Ma Ji , instead of the Chinese characters meaning Crazy Drug. Like most of Asia , the focus is on the speedy drugs. Interestingly enough the two drugs most popular with the foreign communities , Weed/Hash , and Cocaine are left off the list. 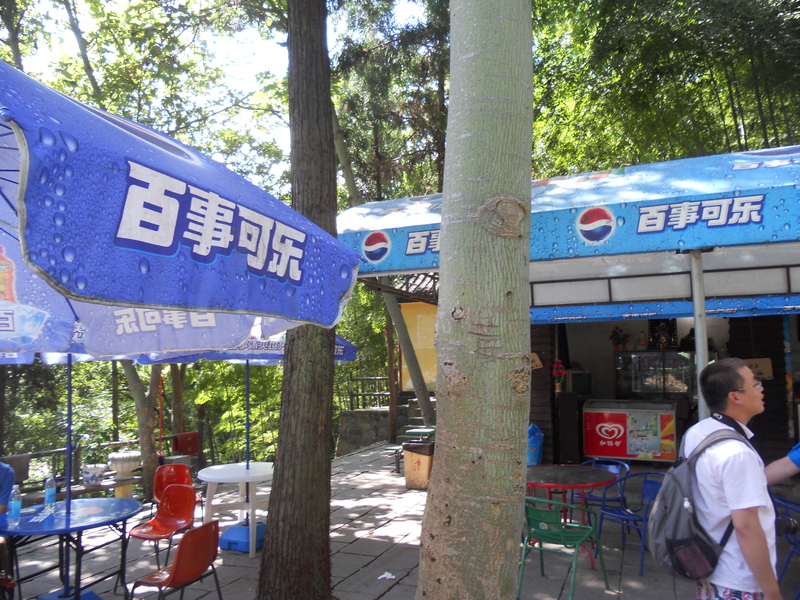 The combination of frugalness and convenience led to SheShan （佘山） or She’s (not the same as English – shhuuuuhh-) Mountain. Frugalness liking the free entrance and convenience liking the appropriately named SheShan Metro Stop. 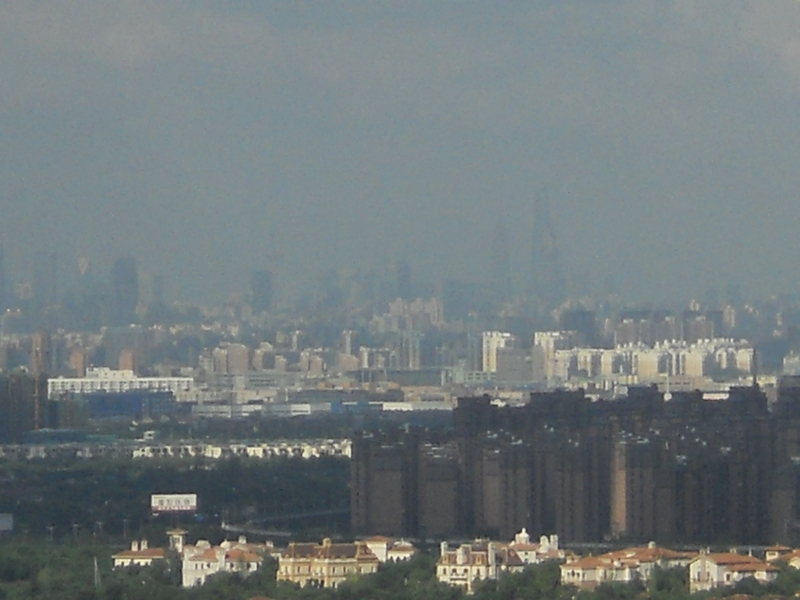 Mountain is more of a misnomer really , as it stands a towering 90 (18% of Shanghai’s current tallest building -Shanghai World Financial Center-) meters over the surrounding alluvial plains. I thought it was the highest natural elevation in Shanghai until a Google search gave that to the 130 meter tall peak of the uninhabited island Dajinshan. 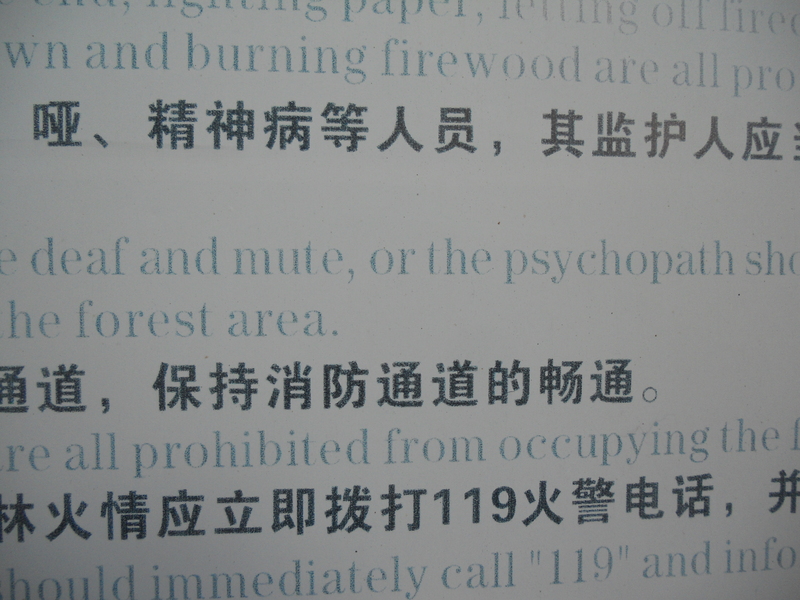 We visited the Eastern and Western parts of the SheShan Forest Park area. 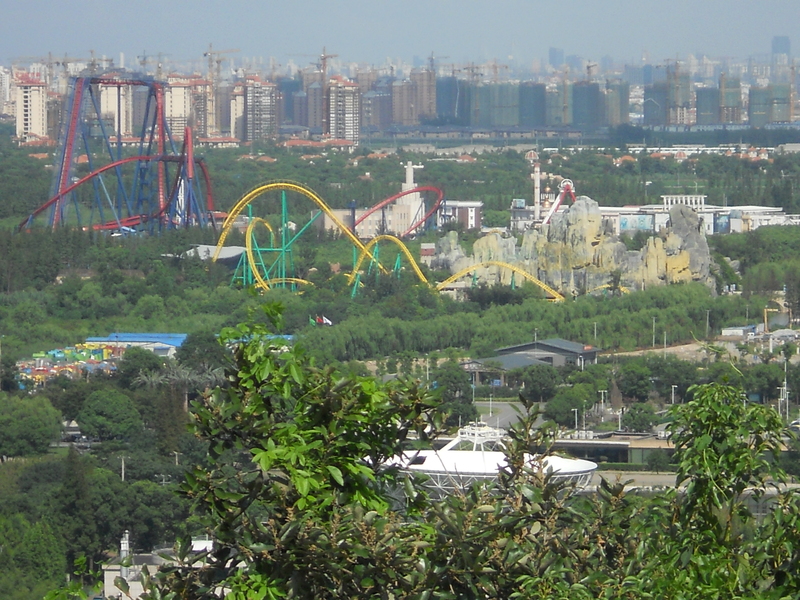 There is more to do in the surrounding environs with several high-class hotel resorts , a golf course, and the adjacent Happy Valley Amusement Park. With those things all costing the big bucks , we stuck to the park. Waiting in a huge line for a death trap? Ehhhhhhh. I had visited the Eastern part of the park with the Flying Dutchman , Pan, waaay back in the distant mists of 2 years ago , but it was time to head back. 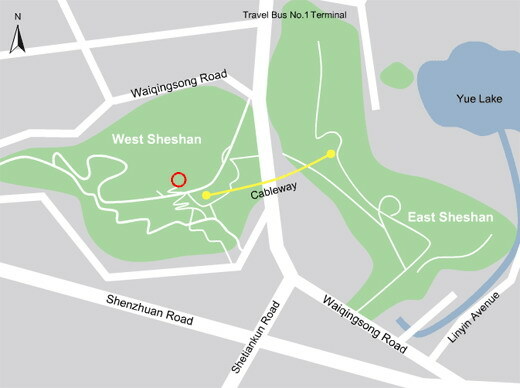 The Eastern part of the park is one of the closest places to nature as you can get in Shanghai. It is a peaceful , easy, stroll through bamboo thickets to get to the peak. There are several good places for grabbing a peak at the outlying countryside. There is even Fragrant Buddha Spring brought to you by Pepsi-Cola©! Nothing says Zen like crappy speakers blasting “relaxing” music and an ice-cold can of PEPSI©! Wanna be a big-bellied Buddha? Two words. Sugar calories! All jokes aside, the Eastern part of the park is really nice. It starts out bizarrely enough , with a free ticket given to you at the booth which you then have to scan through the turnstiles to enter. This is where the previous post came from. Another strange thing about this part of the park is the Roman Catholic Basilica chilling on the very peak alongside a Jesuit Astronomy Observatory. Apparently this church was one of the most important in Asia in the early 1900s with pilgrims from all across Asia visiting. The church was heavily damaged during the Cultural Revolution but has since been restored , and is now an active Church. Visitation is free. The Observatory, on the other hand , costs a measly 12 rmb (little under $2USD) for admission. The museum is totally not worth it but the view from the top of the Observatory is. I was incredibly surprised to spot the Shanghai World Financial Center along with the JinMao Tower (current 2 tallest buildings in Shanghai) from the top! These buildings are approximately 35 kilometers away! All-in-all it’s a great trip if you live in Shanghai and need to break the monotony of concrete with some bamboo. It’s definitely not a come to Shanghai just to see it attraction but if you spend enough time here you should see it. 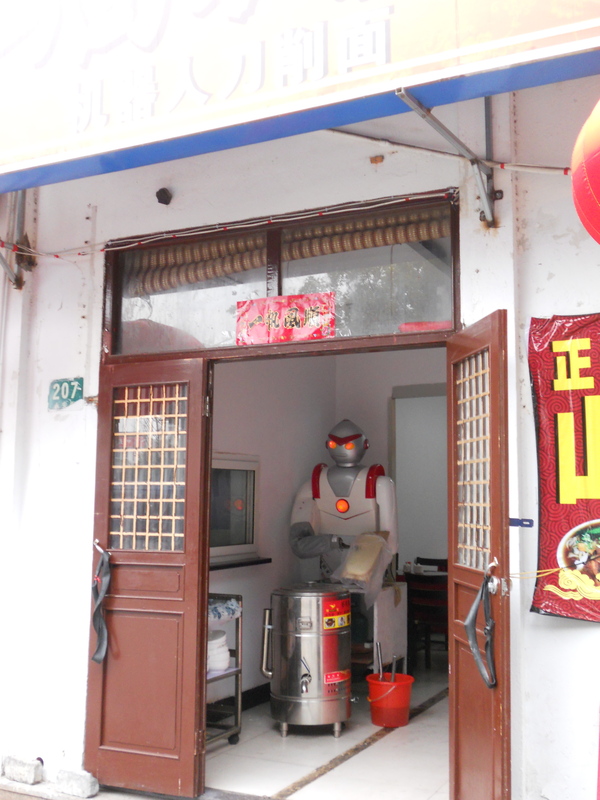 Being out the burbs of Shanghai there aren’t too many foreigners and that leads to some funny things. 1. (In Chinese) Whoooaa! I see a foreigner! 2. (In English after he pretended to shotgun blast his dad off a ledge) Headshot! 3. (No Language) A shocked lingering quadruple take stare. Due to insultingly slow internet speeds and the deplorable condition of my computer at work – you know the kind of computer where the mere art of opening more than one tab to do some research results in mind-numbing , brain crippling freezes , crashes, and blue screens of death?- , in lieu of the SheShan (Shanghai’s “Mountain”) trip , I will be presenting SheShan’s Awesomely Insulting Chinglish. 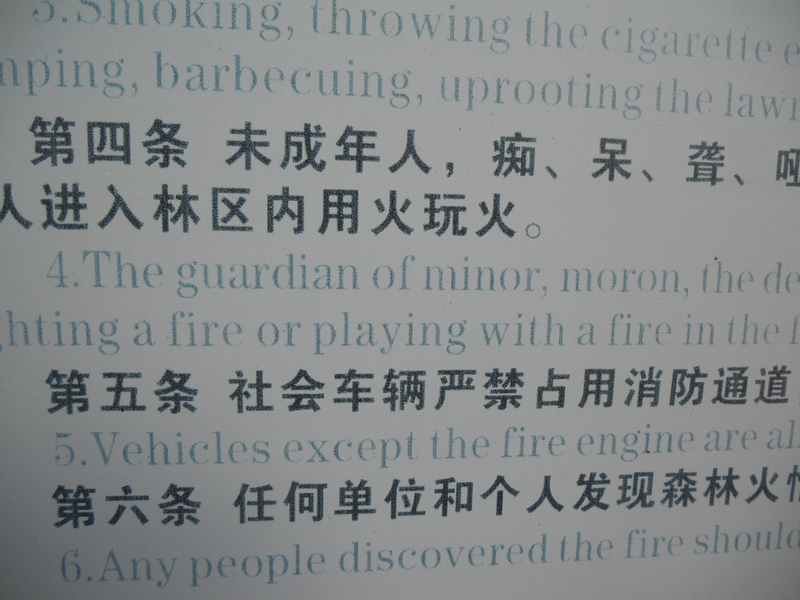 “The guardian of minor , moron, the deaf and mute, or the psychopath …” blah blah blah something to the effect of don’t light or play with fires. DAMN SON. What started out pretty innocently with “Guardian of minor” brutally turned to “moron” before subsiding to “deaf and mute” , and then lurching full force back into the attack with “psycopath” . Please if you have a psychopath in your care , I strongly advise into bringing them into public places. If you must bring them into public places then by all means keep them as far away from fire as possible (also pointy things and things that go boom boom are out-of-bounds). Apparently if you happen to know a moron, be sure to keep them safe as well! HAHAHA. Also sign makers do please take care to not indiscriminately lump together deaf, mute , children , along with morons and psychopaths. Urban is a theme I can really dig , living in Shanghai and all. Can’t get much more urban than the view from my old apartment. The first time I stepped out onto the balcony and saw this , I was in love! 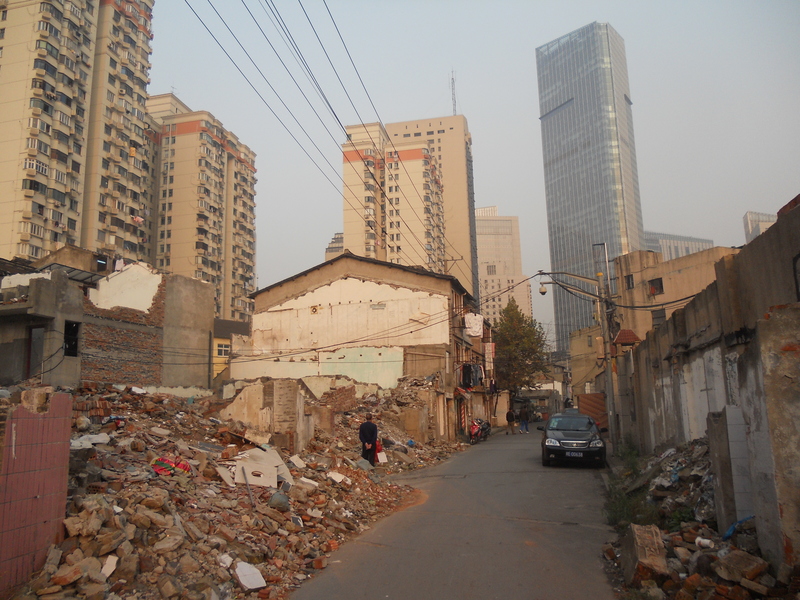 Here is one more that I feel highlights the changes Shanghai is going through right now. It takes a lot of work to transform from a stifled Commie city to a thriving Commie Capitalist city. What is the man there thinking? Alone and cast adrift in the midst of the rubble. Reminiscing or dreaming of a better tomorrow? Photo of the Day- Can’t Read the Sign? My bet is on the rider just ignoring it. 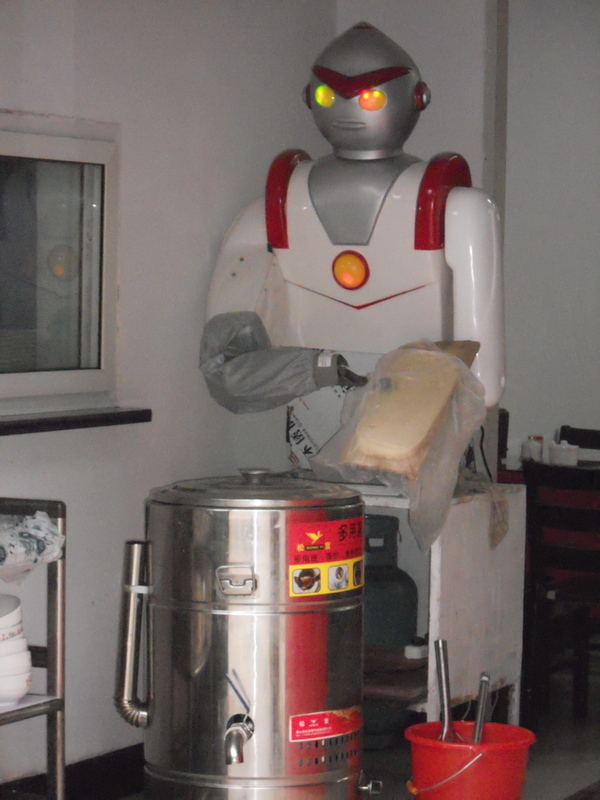 Robot Noodles! What more can I say? This isn’t a common sighting , in fact I’ve only ever seen this one. This was taken waaay out in the northern boonies, Anting terminal station on metro line 11. Awesome! Usually the Romantic Comedy genre isn’t quite for me, although it can be worth a few laughs. 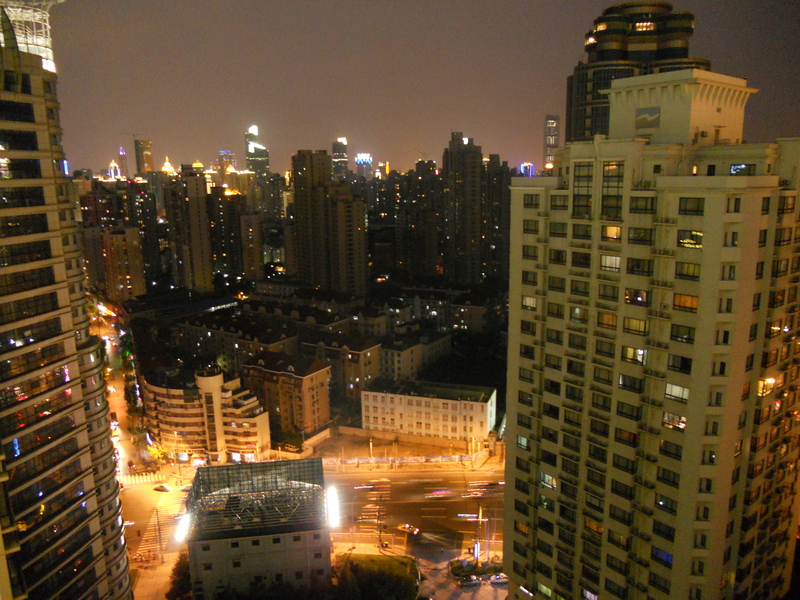 What the movie makes up for in plot and believability is the setting – Shanghai. You can tell the writers have a love for the city and want to show it off, and that is what saves the movie for me. Actually filmed in Shanghai ,apparently quite hard to get filming permission , I loved picking out sites that I knew , ” Hey that’s Southern Belle!” ” I had drinks there for St.Patty’s!” “Ohh that’s the coffee shop I used to go after classes on Friday!” and just marveling in the cinematic sweeps of the Pudong Skyline that were so popular in the movie. The best part of the setting for me was thinking that one of the main’s characters’ , Fang Fang , family’s neighborhood looked quite familiar , and then confirming it when an address sign appeared. 162 JianGuo Xi Rd! I knew it! 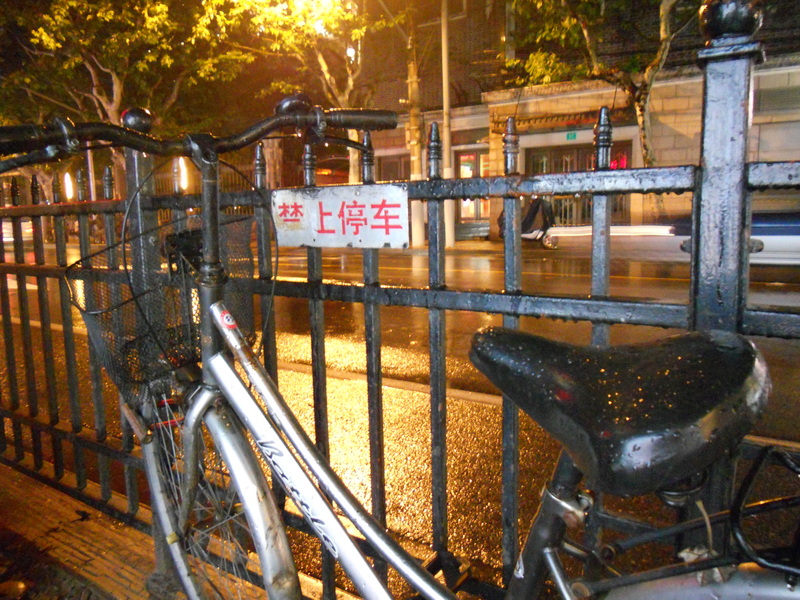 It’s Bu Gao Li, the old style Shanghai Shikumen neighborhood that lies directly next to my apartment. Seriously. That was awesome. Maybe not so much for others. I just wished Fang Fang really lived there. She’s so hot! Another thing that made the movie enjoyable were some of the jokes that I could definitely relate too , myself being an expat in Shanghai . Construction on the apartment next to yours at 8am? Check. Waitresses continuing to speak only with your Chinese friend even after you’ve (non-Asian) proved yourself capable of speaking Chinese? Check. Funny Aiyi? (maid) Of course! Foreign Actors being hired to impersonate a Lawyer or Businessman? Check. Cute little blonde hair , blue-eyed , girl preferring to speak Chinese? Yes! I especially like this one with my experiences at the Kindergarten. ( This one little Caucasian is much more confident with Chinese and will address me (another foreigner) in Chinese. Hahaha. Some of the stuff in the movie was strange and I didn’t quite get it. English teacher (and one who is fond of calling off) buying a brand new Cadillac as his ride? How the hell did that happen? I can only dream of getting a nice car on my salary, and then I would be too terrified to drive something nice in the chaotic traffic. The main characters running into each other on the Bund’s promenade two or three times? True it gives the cameras an excuse to do another panoramic of the Pudong Skyline but seriously of those who live in Shanghai , how often do you make that riverside walk? That is a complete tourist thing to do. Sure I’ve made the walk plenty of times , when I was showing my visiting friends and family ! I think I would be a bit hard pressed to take a date there. So, If you happen to be interested in the city of Shanghai itself , get a glimpse of expat life, or like romantic comedies (:/) check it out. It’s only showing in the movies theatres in China right now ,and in an ironic twist straight from the movie’s main plot is also available in our pirated DVD shops. (Barely opened in the theaters , that was fast!) Keep an eye out for it in upcoming American, European , and Asian film festivals.